The Jakarta Players will perform Mike Folie’s adult comedy Naked Mole Rats in the World of Darkness from November 13th until November 15th, 2015 at the Pavilion Apartments’ Clubhouse. Curtain is at 7:30 pm on Friday and Saturday evening, with 2pm Saturday and Sunday matinees. 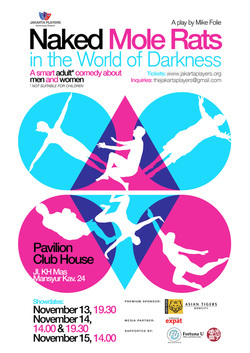 The play will close out Jakarta Players’ successful 2015 season. Mike Folie’s play is a fast-paced, savvy, sometimes bawdy and always hilarious romp through the dynamics of male-female relationships, with short scenes and monologues that range from hysterical to absurd to bittersweet. From a cop busting the man who once stood her up at senior prom to a fading movie star meeting up with her ex-husband at the airport, Naked Mole Rats in the World of Darkness offers something for everyone. This play is suitable only for adults. Andrew is joined by John Packer, Jasmin Webb, Mia Djojowasito, Christopher Betts, Rizal Iwan, Gene Sugandy, Angela Richardson, and award-winning actress Marissa Anita.